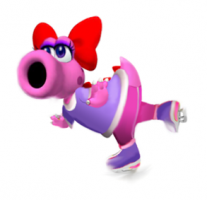 RUMOR: Birdo Coming to M&S Winter Olympics? This Picture Suggests It…But Where’s it From? The sexually ambiguous staple of the Mario franchise may soon be skating to an Olympic sized video game near you. That’s if this CG picture pans out to be true. Decked out with a sweater and ice skates, the photo of Birdo suggests that he/she/it will be joining Mario, Sonic and company for the pending October release of Mario and Sonic at the Winter Olympic Games. The character was not in the original Summer Olympics game; in fact, researchers uncovered an unfinished model of it and others in that original title, indicating Birdo was at least in the works. Thus far–at least in our coverage–Birdo hasn’t showed up in a playable form. To assess its legitimacy, you need to know the source, which is the Super Mario Wiki. The artwork is claimed to be official there, but on the wiki’s own page dedicated to M&S Winter Olympics, Birdo is not acknowledged to be confirmed. Further, while some wikis and other new media encyclopedic sources are tightly maintained, others are not, and there’s no way to know how the Super Mario Wiki is maintained. So, what do you think? Is Birdo a lock, or is it just too good to be true? Tell us below, and in doing so, thank Edwin Shy, for he brought this picture to our attention via our News Tips system.